A Magazine Devoted to The Occult Sciences, Mystical Philosophy, Alchemy, Hermetic Archaeology, and the Hidden Problems of Science, Literature, Speculation, and History. / A Magazine Devoted to the Occult Sciences. London, England. Publisher: James Elliott and Co. Editor: Arthur Edward Waite. 1/1, August 15, 1894-2/5, June 15, 1895. 48 pp. Eleven numbers. Frontispiece paintings in several of the first issues by Mme. Isabelle de Steiger. Supplements in the last issues of lists of occult and spiritualist books, most prominently by Waite himself, for sale. Contributions by Waite (1857-1942), A.P. Sinnett, Arthur Machen, de Steiger, Edward Maitland, Emily Kislingbury, David Gow (Waite's friend and later editor of Light), etc. Waite (1857-1942) was a voluminous author (of impenetrable prose) and creator or joiner of societies important in the history of modern occultism and mysticism. His ringing introduction to the new journal proclaimed that it "is established chiefly to represent and increase the interest attaching to the investigation of those mysteries which are called transcendental, occult, and mystic. They will not be its sole subject, but it will treat in the main of these, and will avowedly make use of all means at its disposal to spread the knowledge of Mysticism and to multiply the acceptors of its instruction." 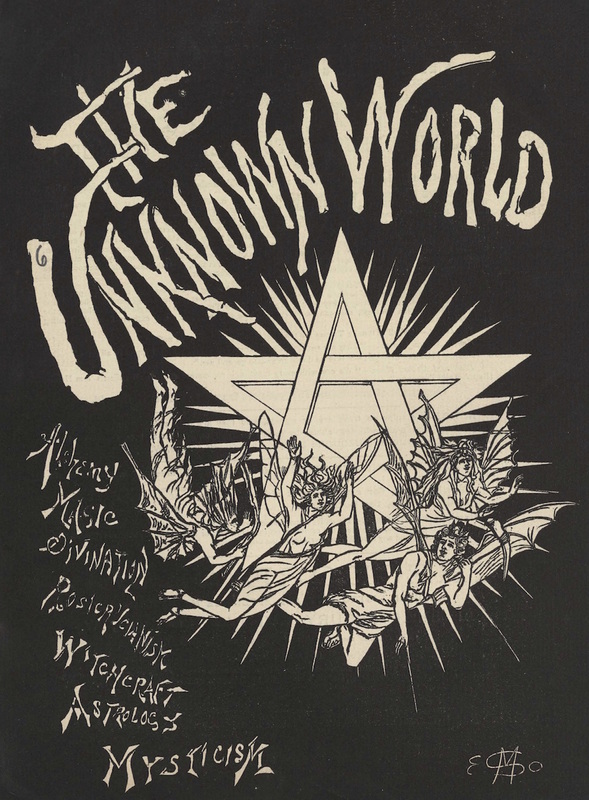 "The Unknown World has been founded to represent, as we believe, for the first time in periodical literature, the whole circle of the Occult Sciences. It will deal with their methods, history, and literature in such a manner that they will become intelligible to an unversed reader, while at the same time there will be matters of special interest and value to the well-equipped and earnest mind." Waite was quick to point out that these investigations "will not . . . be devoted to the past. It will be in all respects a representative mystical magazine, and as such it will not infringe upon ground already occupied with signal ability by several psychological journals." F. Leigh Gardner, A Catalogue Raisonne of Works on the Occult Sciences, Vol. 1, Rosicrucian Books (London, 1903), notes that "a good deal of space, however, is occupied by articles on the notorious 'Lake Harris,' of 'Laurence Oliphant' fame, etc., a fact which may have had something to do with its downfall." These objectionable articles were by "Respiro" (Dr. E.W. Berridge), a British disciple of Harris's and of "internal breathing" and a member of the Order of the Golden Dawn, references to which appear throughout the journal. The more prosaic reason for the journal's cessation was the fact that, as admitted in its next to last issue, while it had been "self-supporting" it was "not profitable." The journal carried thoughtful book reviews by Waite and others, including a review of C.G. Harrison's Transcendental Universe that had introduced the notion of the competing occult brotherhood behind H.P. Blavatsky. (Waite was not impressed.) It also published translations (from the French) of the likes of the Grand Grimoire that helped re-introduce into contemporary occultism the full panoply of ritual magic, and the lengthy disquisitions of "G.W.A." (the Rev. George W. Allen) on the Society of Christo-Theosophy, one of numerous attempts to westernize Blavatsky's Theosophy. Hamilton College; Harry Price Library; University of Miami; LOC; Columbia University; Yale University; Harvard University; Brown University; University of Texas, Austin; University of London; and other locations.